Ergonomically designed for handheld use -- compact size is ideal for smaller hands. Staples up to 25 sheets -- 25% greater capacity than other desk staplers. Jam-free with Swingline S.F. 3 staples. Stands vertically or sits horizontally. Metal with soft-feel material. 2 1/8" throat depth. Loads a half strip (105) of 1/4" standard staples. Guaranteed to perform at the highest standards, including no jamming, for the life of the warranty (assuming normal product usage) or Swingline will replace the product. Manufacturer's limited lifetime warranty. All sheet capacities are based on 20-lb. bond. Welcome to MyBinding video. 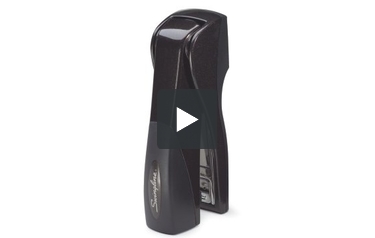 This is a look at the Optima Grip Compact Jam Free Stapler by Swingline. Super comfortable to grip and mighty strong for its size, the Optima Grip is a great little stapler. It can fasten up to 25 sheets of 20lb paper in one punch and has a throat depth of two and one-eighths inches. It's great on the desk and in the hand. It's lightweight and can staple three ways: standard, tacking, and temporary pinning. Refilling staples is just as you think; lift the top, slide them in, flip it down, give it a tap, you're on your way. That's the Optima Grip by Swingline. For more demos, reviews, and how-tos, check out MyBinding.com.